Hello and welcome back for another Yippee For Yana video! Today I’m bringing you a floral Spring inspired Thank You card with alcohol marker coloring on colored cardstock. I’m not one to have master coloring skills, but I am the kind of person who will try the unexpected to see if it works. And today that unexpected is coloring on gray paper instead of white. 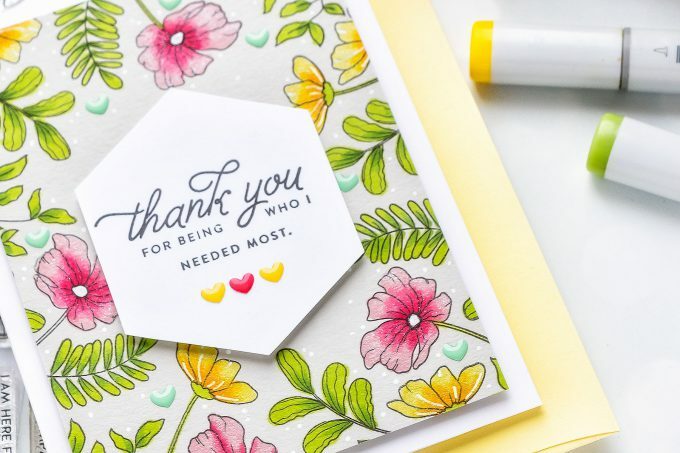 I started working on my card by stamping a sentiment that reads “Thank You For Being Who I Needed the Most”. 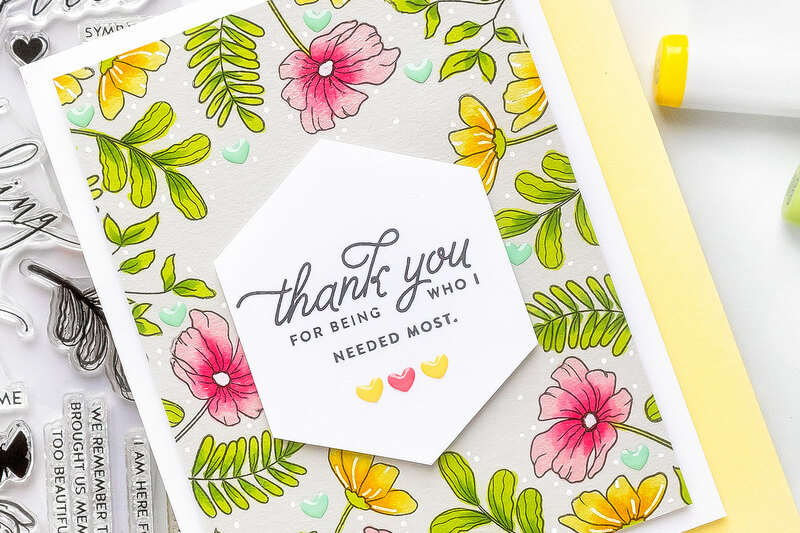 As I work on this card you’ll see me change my mind and replace the sentiment with the one stamped in black ink on white cardstock (watch video for details). 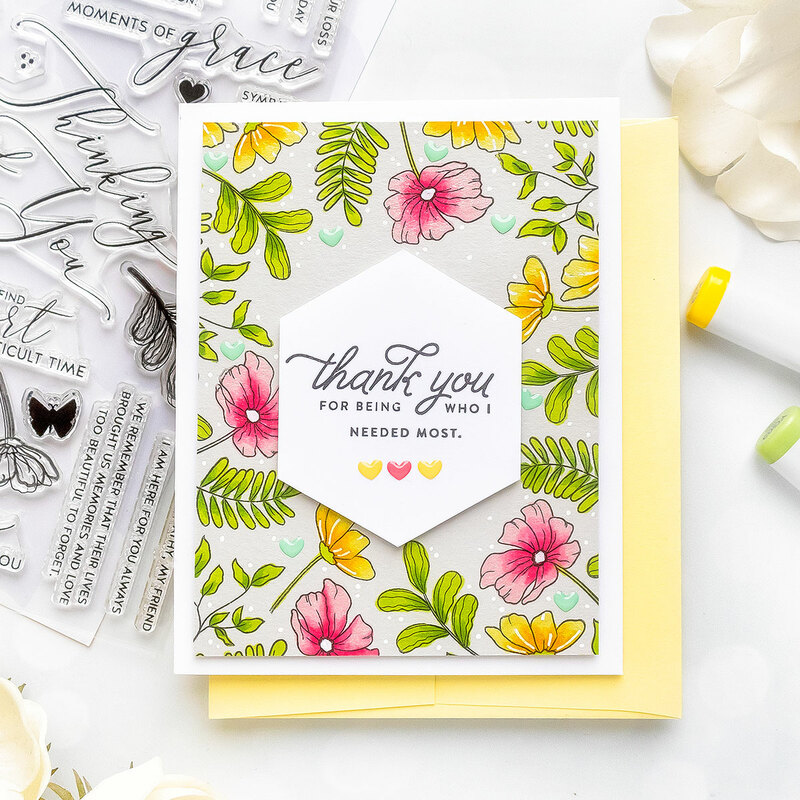 I started with the sentiment here first as I needed to see how much room it would take on my card, my idea was to use beautiful flowers from the Moments of Grace stamp set and stamp a floral frame around the sentiment coming in from the edges. 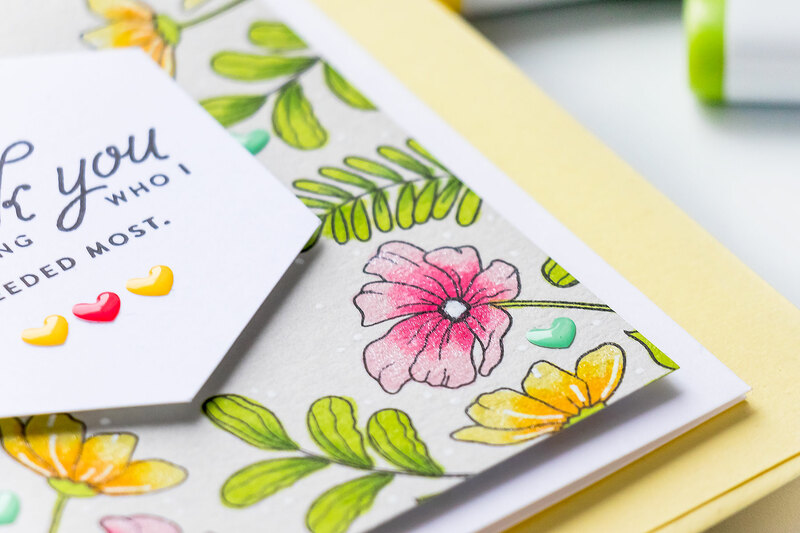 When I was planning this card I knew I wanted to try and color these images with my Copic markers so I picked Simon’s Intense Black ink for stamping these images. This ink has many great properties including being alcohol resistant so it makes it the perfect choice for this particular project. I picked a few images from the Moments of Grace set and stamped them in black ink forming the frame. I didn’t use my stamping tool here such as MISTI as when I do this much stamping it just slows me down, I went with good old clear blocks and kind of hoped I wouldn’t have any problem areas on my stamping (and I didn’t). The key to stamping a frame like this, where your images are almost all identical in size, is to stamp them one by one next to each other. For this project I also pulled out most of the clear blocks from my stash and I mounted each image onto its own separate block. This is vital to stamping efficiency, and also to clean fingers. If you use just one or two blocks and stamp a multitude of images you end up having to remove the image from the block a bunch of times and if you are like me, if you don’t clean your stamps, you run the risk of getting your fingers dirty and thus leaving an inky fingerprint on your card. 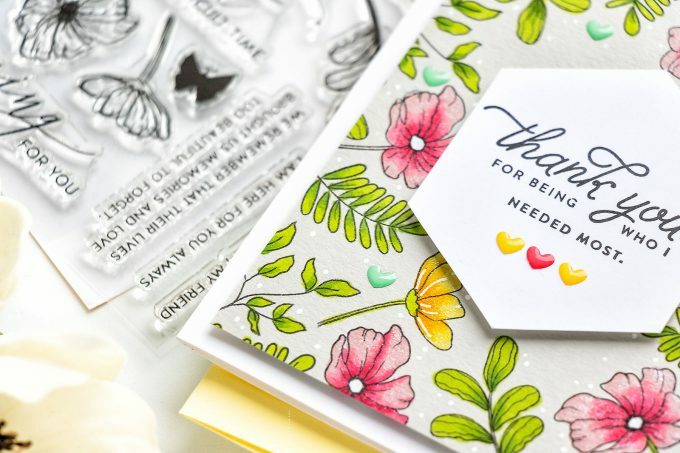 Once my floral stamping was done I also used a heart image from this same stamp set and stamped it several times in the background filling any gaps. Later, I once again changed my mind about the black hearts, I didn’t like how dark they looked and I replaced them with colorful enamel hearts instead. Before I started coloring my panel I used the scrap pieces of Fog cardstock to test the Copic marker colors I was planning to use. Alcohol markers are translucent, meaning they will not give you opaque coverage, you’ll be able to see the color of your surface from under the coloring. It’s always best to use these kinds of markers on white cardstock to have their true colors show. But that doesn’t mean you can’t try and color with these on other, light colors of paper for slightly different results. I love to have non white background for my cards and this prompted me to try and color with these markers on colored cardstock. The colors will not be the same as they would be on white paper, they will be duller, but they can still be used to color with. I used RV14, RV13 and RV11, YG17, YG03, Y17, Y19 and Y13 colors. I had trimmed this panel down to 3 3/4 x 5 “ and foam mounted it onto an A2 white side folding card base. Next I a used a white pen and added lots of white dots in between the stamped images. What a beautiful stamp set for this design. 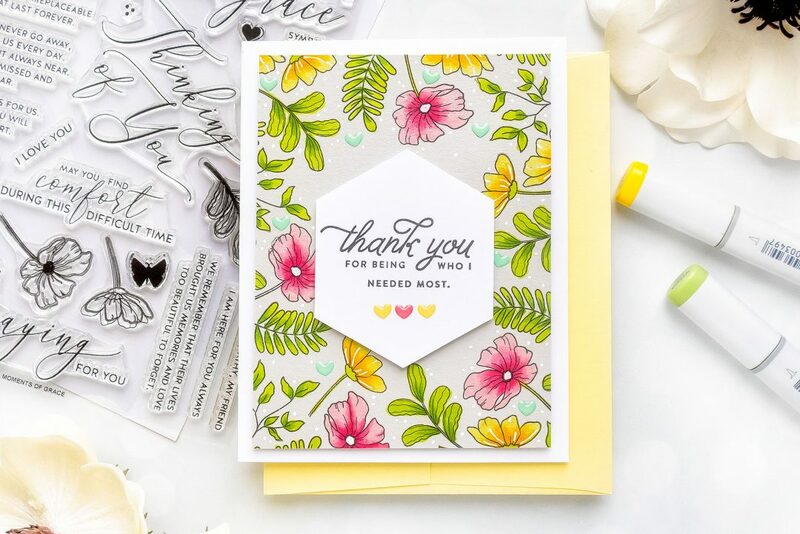 I love the idea of trying Copics on coloured cs and this is truly stunning! Yana. Your ideas are always fantastic and your tutorials are so easy to follow, thanks for sharing them! 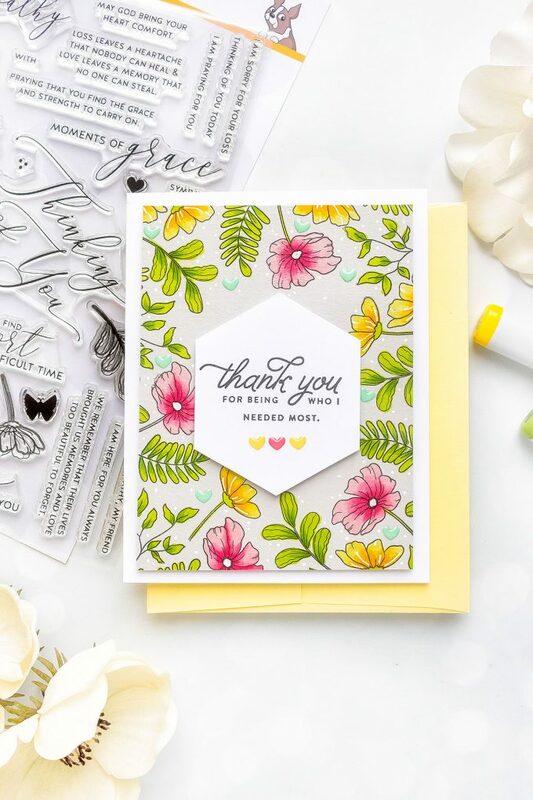 How very beautiful the flowers look on the light grey cardstock. What a great idea, thanks for the video too. 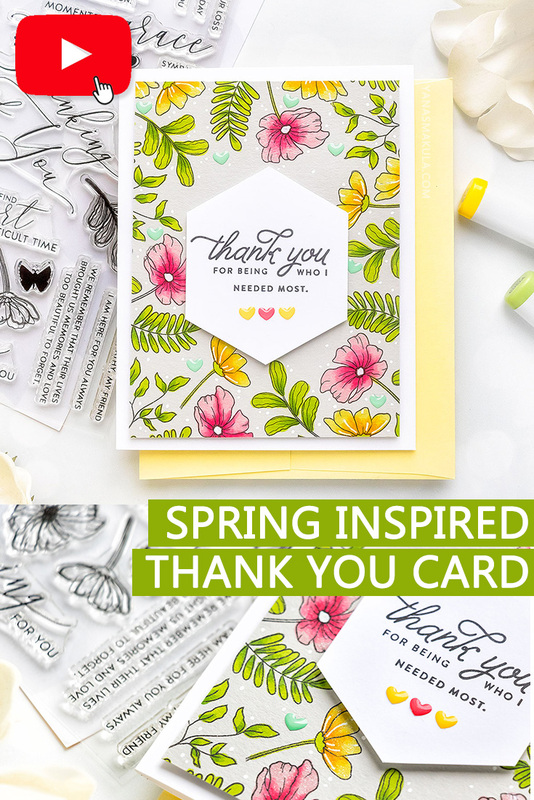 Beautiful Spring inspired card! Love the coloring on gray and the white polka dots filling in the gaps. Thanks for sharing your creation process. I love when a card speaks to you and tells you to do something different. I’m really amazed at how vibrant the colors on grey cardstock looked once dry. Beautiful card! This is lovely. Thanks for the video. I like the hexagon and enamel hearts better also.